These pages are meant to supplement the lecture videos, textbook and Aplia exercises. Each page focuses on one of the core concepts that we are learning in this course. Each page provides a brief overview of the topic and then presents an Interactive Graph. The interactive graph is the main purpose for these pages. You can play around with the graph, see how it changes as you change factors, assumptions, and are presented with new scenarios. Then you can test your understanding by answering a few "self-check" questions that will help you prepare for your exams. The interactive graphics use a powerful mathematical software called Mathematica. All of the computations are done in the cloud and, as a result, can be unstable from time to time, especially depending on your browser. Usually any instability goes away after several seconds, so just be patient. Among the browsers, Google Chrome seems to be the most stable. An overview of the trade-offs faced by societies, scarce resources imply a production possibilities frontier. However, economic trade between individuals or countries give important gains that can shift out the frontier. An overview of the basic supply and demand model for determining a market equilibrium. This page emphasizes shifts in demand and supply. There are lots of examples presented. 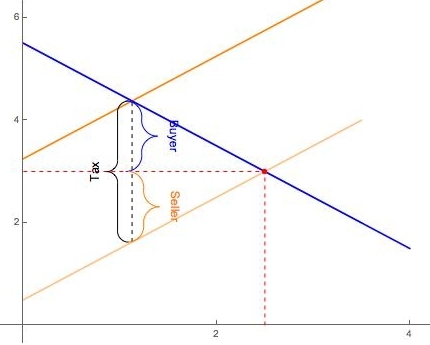 The interactive graphic presents lots of scenarios for shifting the supply and demand curves. An overview of how price controls (e.g. minimum wage laws) and sales taxes affect market outcomes. Answers the question: do competitive markets maximize social welfare? Also, studies how taxes lead to inefficiencies in the form of deadweight losses. Background for the chapters to come on perfect competition, monopoly etc. What are firms' costs and what factors influence them? The model of perfect competition and how firms behave in the short-run and long-run. Includes an interactive graph of the basic perfect competition model at the firm and market level.